Lung cancer remains one of the most dreaded diagnoses to consider for many in the US and worldwide. Infamous for both its subtle early symptoms and the speed with which it can develop, it’s an important illness to understand and be wary of for those who want to live a long, healthy life. As with any cancer, early detection is key to a full recovery—and early detection depends on awareness of your body, knowledge of any risks you’ve exposed yourself to, and the effective work of medical professionals who care. To make sure you’re not caught unaware, educate yourself today on the most common symptoms and most significant risk factors for lung cancers. The more you know, the less likely you are to find out about this disease too late. In many cases, lung cancer symptoms begin with chronic coughing. This doesn’t mean the worst cough of your life or something you can’t ignore; it can be a minor annoyance, a cough that doesn’t hurt and isn’t forceful but just won’t go away. You may not even think much of it until all the coughing makes you go horse or draws comment from a third party. Cancer severely taxes the immune system, especially in its immediate area, so it should come as no surprise that chronic lung infections often go hand in hand with cancer in your lungs. One respiratory infection, even two in a year isn’t a big deal, but when it seems you can’t go more than a few weeks without a new problem, it’s time to have a doctor take a closer look. Many only notice cancer when it begins causing chronic shortness of breath. This can manifest in running short on breath sooner than usual when exerting yourself, or in spontaneous shortness of breath when sedentary. This can also be your only early warning of a silent heart attack, so unusual shortness of breath should always be taken seriously. Chronic pain in your chest or in your shoulder that isn’t specific to certain movements or only happens when breathing or coughing should be taken seriously. It doesn’t necessarily need to feel close to your lungs or associated with your lungs; like heart conditions, pain in your lungs can be referred, meaning it can seem to stem from unrelated areas. This happens because of the sheer volume of signals coming from nerves which aren’t nearly as precise as the ones in, for example, your skin. If you’ve ever had the flu or a similar viral, you know the symptoms: fever, weakness, difficulty sleeping, fatigue, etc. Cancers in all forms often cause the malaise and general unwellness you associate with intense viruses such as the flu. You should be seeing a doctor just in case with these symptoms anyway, if only to help keep symptoms manageable while a virus runs its course. 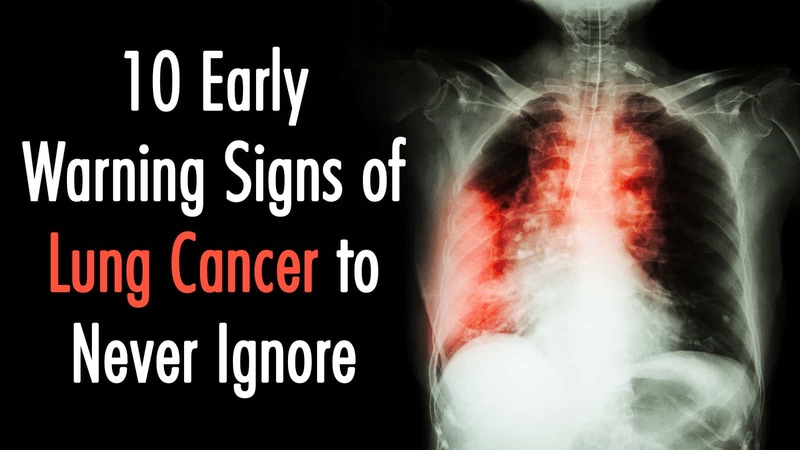 Cancers in your lungs often begin to involve your chest, neck, and face as it spreads, often triggering the swelling of lymph nodes in those areas. 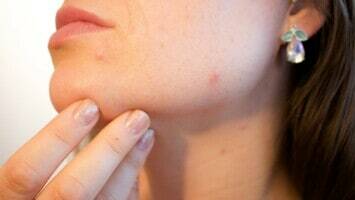 While many of these nodes swell up with nearly any infection, virus, or other ailment, others are strongly indicative of a serious problem. For example, swelling of the lymph nodes along your clavicle is extremely worrisome, especially in older patients. Sometimes, lung cancers—and any other cancers—only give themselves away in generic aches and pains. The cancer in your lungs and other tissues can cause inflammation, headaches due to reduced oxygen intake, and other aches and pains that don’t seem at all associated with your lungs. For this reason, patients should always take unexplained increases in headaches, aches, and other problems to the doctor—just in case. The most famous risk factor and cancer, and still one of the most dangerous and deadly. Cigarette smoke is not only directly carcinogenic to smokers, it poses a significant risk to third parties in the form of second-hand smoke. 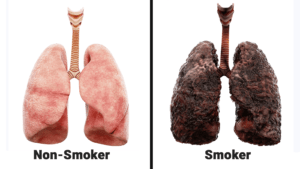 The risks of smoking are not limited to tobacco, either, as most substances when smoked directly introduce at least some amount of carcinogenic ash to your lungs. Changes in filter technologies and other differences in cigarettes have changed the way cancer manifests in some cases, but not diminished the risk of the disease . The second-leading cause of developing cancer in your lungs in America , radon is the most significant carcinogen for non-smokers who don’t work in hazardous environments and works to multiply risk of cancer in smokers. Radon is a naturally occurring substance which is produced from the breakdown of uranium in the soil and rock, which means it can spring up nearly anywhere. While radon outdoors is rarely concentrated in significant amounts, dangerous concentrations can occur indoors nearly at random. For this reason, radon testing is recommended for all buildings. While low levels of asbestos exposure aren’t strongly associated with cancers of the lung, working in an industry which still regularly uses asbestos is. The risk increases even more in those who both smoke and suffer regular exposure to asbestos, with the two combined creating a much higher risk factor than either independently. A huge number of workplace chemicals and minerals serve as carcinogens increasing your likelihood of lung cancers when inhaled, including but not limited to coal products, compounds used in electronics, industrial chemicals, diesel exhaust, etc. While an improved understanding of the risks of inhaling these products has improved the handling of exposure in these industries, safety regulations only work when followed correctly. Living in cities with significant air pollution without taking steps to avoid exposure can greatly increase your likelihood of developing lung cancers. A well-sealed home and work environment with effective air purification is vital, and in severely polluted environments outdoor face masks may be advisable. Radiation treatments affecting your chest and lungs for other cancers can greatly increase your chances of developing various lung cancers, in addition to the general risks of recurrence. And of course, previous incidents of lung cancer will always strongly indicate the possibility of later occurrences. Like many cancers, lung cancers tend to arise in families, though it remains unclear whether this is primarily due to genetic factors or shared lifestyle and environmental factors. Familial risk is notably greater in families where relatives first had an incident of lung cancer at a young age, which may indicate that early onset of lung cancer has a more significant genetic component than lung cancers which arise later in life. Of course, these aren’t the only risk factors—everything from sugar to hamburgers offers some level of carcinogenic risk for one form of cancer or another. But these are the ones that stand out at major contributors to lung cancer rates in the United States. Mostly, direct damage to the lungs is your greatest risk. Which means caring for your lungs and thinking carefully about what you breathe in is crucial to minimizing your risk of lung cancers. Lung cancer is a scary thing. There’s no denying that. All the more so when you realize that the risk factors are only factors, and that lung cancers can occur for no apparent reason in otherwise perfectly healthy people. It’s not just a disease that hits coal miners and smokers. But education on the risks and reality of the illness can give you a major edge in detecting the early signs when safe and effective treatments can still work to reverse the damage done before it spreads and becomes infinitely more difficult to manage. Sooner detection is always better. So take that little cough and your chronic fatigue to the doctor, if you’re at all worried about it—if it’s nothing, you can go back to being carefree, and if it’s something, you’ll be ready to fight.